Asus Padfone delayed by Qualcomm S4 shortage? 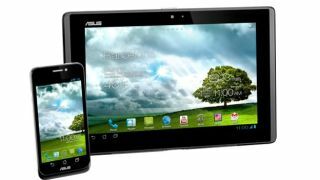 The strange-yet-intriguing Asus Padfone three-in-one hybrid device may be the latest gadget to suffer from the chip shortage at Qualcomm. The Android Ice Cream Sandwich smartphone, which docks into a 10.1-inch tablet 'mothership' and can also be slotted into a keyboard, was scheduled to arrive sometime this month. However, the Taiwanese company sent out a tweet today all-but admitting that the lack of S4 Snapdragon processors emanating from Qualcomm means it'll be later than planned. Asus Indonesia tweeted: "Unfortunately this is the chip inside the Padfone." Pushed for a follow up by The Verge, an Asus spokesperson admitted: "I believe [the shortage is] affecting all of Qualcomm's customers." So, while that's not a direct admission of a delay to the launch schedule, it's not looking too good for the latest Transformer-esque gadget to emerge from Asus. Last month Qualcomm said it was working to combat shortages of its S4 chip by working with manufacturers to move them to alternate systems. The US-based chip-maker said it would not have enough Snapdragon processors to fulfill demand and conceded it may lose customers to other companies as a result.